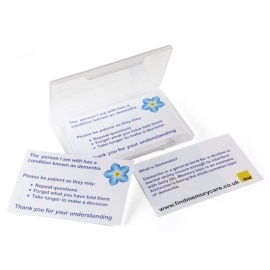 The Dementia Patience Cards helps individuals with dementia explain the condition to strangers. Great for excursions and trips out, the cards help the dependent retain dignity. Includes wallet and 20 cards. Excursions and trips out can be a great experience for those with dementia. Helping to make them active and engage them in new environments is incredibly important for their overall wellbeing. However, not everyone is as patient as you, and it can be uncomfortable when someone who doesn't understand dementia encounters someone with it. 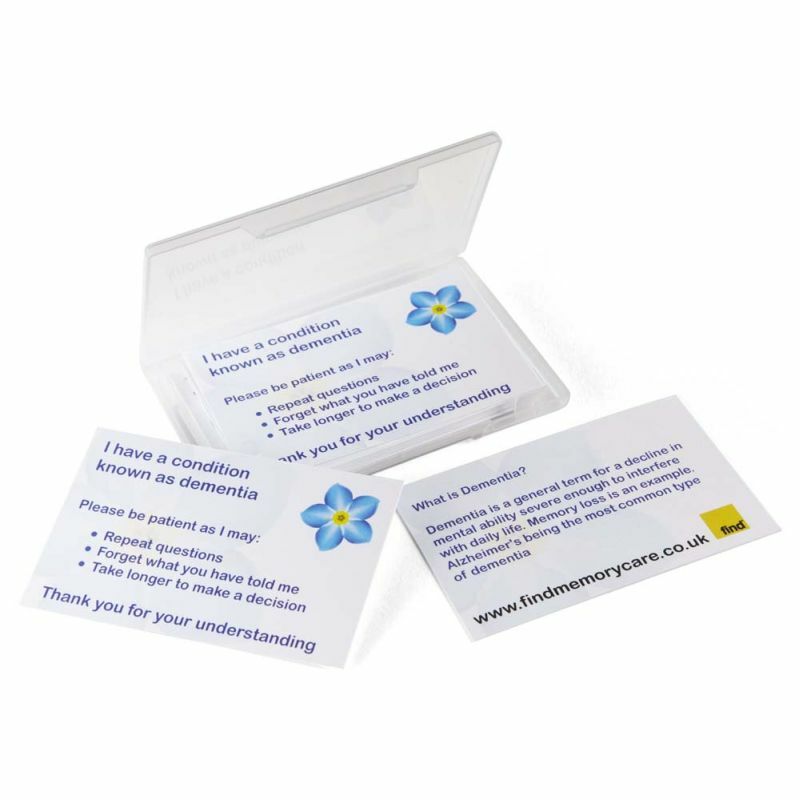 The Dementia Patience Cards presents a novel solution to this problem, enabling individuals under your care to give a clear and concise explanation of dementia before conversation even starts. If you are suffering from dementia, explaining why you may need things repeated or ask the same questions frequently may be difficult. 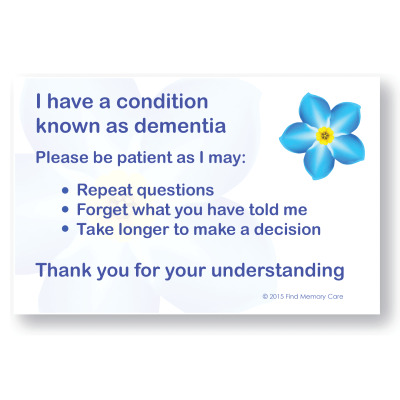 The Dementia Patience Cards are an easier way for anyone suffering from dementia to explain their condition to a stranger in a polite and clear way. This can in turn improve levels of understanding and ensure that everyone you encounter can accommodate your condition. Individuals such as waiters may not be as patient with those with dementia as they may need, which can lead to stressful and awkward situations. The patience cards help to reduce the chance of these situations occurring, helping both you and your dependent enjoy your days out stress-free. Providing a clear description of dementia before any conversation starts enables both parties to have a greater level of understanding, facilitating communication and helping everyone have a better experience. 20 cards are included with the set, suitable for a range of encounters in a range of environments. The set also includes a handy plastic carry wallet to keep the cards stored safely in a bag or pocket when not needed. 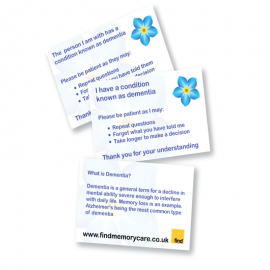 The Dementia Patience Cards Refill Pack includes 50 cards. 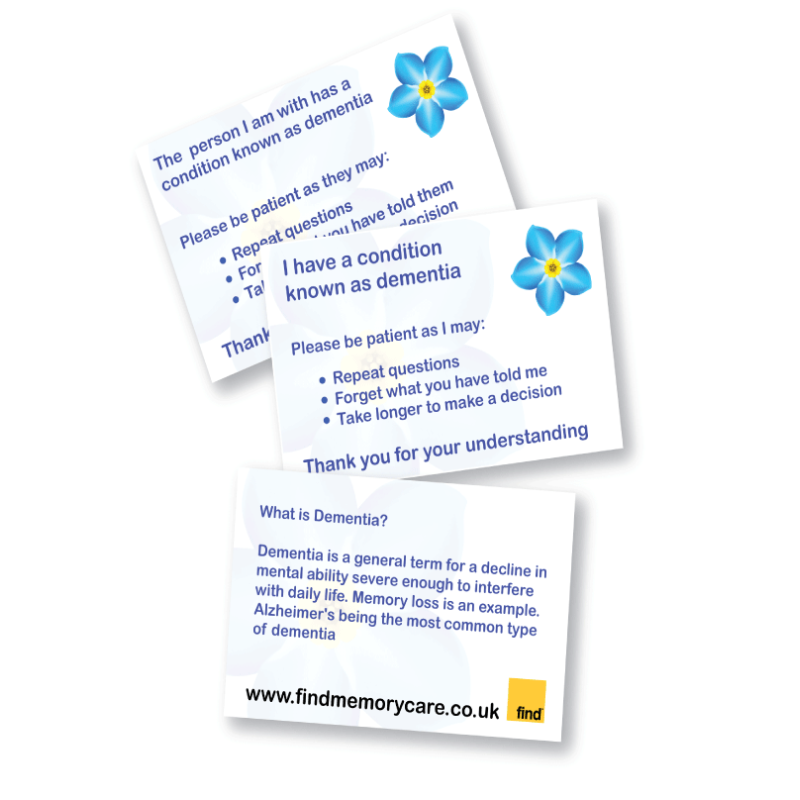 Helping to explain dementia to strangers, the cards are great for excursions and trips out, helping the dependent retain their dignity. 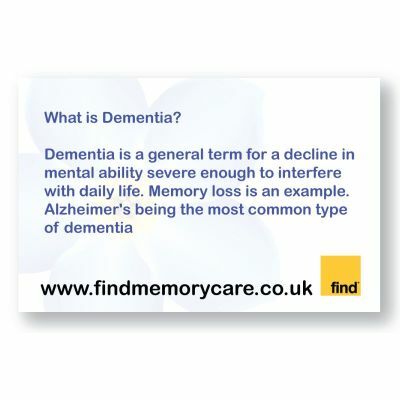 Dementia Patience Cards helps you explain dementia to strangers. Great for excursions and trips out, the cards help the dependent retain dignity. The pack includes a wallet and 20 cards.